DC Password And Encrypted Data Manager Doc - Data Synchronization - Douglas Computing, Inc. Please note: the steps outlined in this section of the tutorial, requires the user has administrator privilege. The DC Password And Encrypted Data Manager allows users to take advantage of online drive services such as Dropbox, to synchronize data across copies of the application, on Windows devices. This will ensure that all copies of the DC Password And Encrypted Data Manager, work against exact copies of the underlying data. Also, data synchronization will result in changes made to the data in a copy of the DC Password And Encrypted Data Manager, appearing in all other open copies of the application, on other PCs. 1) Click on the Miscellaneous tab on the application's ribbon bar, then check the Synchronize Data check box, in the Data Synchronization section of the ribbon bar. 2) If you haven't already done so, install Dropbox onto the PCs you have installed the DC Envelope Printer And Encrypted Data Manager application, where you would like data synchronization to take place. 3) On one PC, create a subdirectory in one of the directories associated with the Dropbox service on your computer. E.g. under the Dropbox directory on your PC, create a directory with the name DC Password Saver. 4) After you have initially entered the DC Password And Encrypted Data Manager, use the Save As feature in the application menu shown above, to save a copy of the application's main data file (*.dps), to the subdirectory you just created in the Dropbox directory or subdirectory. Note: the above action also makes the copy of the application's main data file you just created, the current main data file. Note also: the above action saves a copy of the directory associated with the main data file, in the subdirectory you created, in the Dropbox directory / subdirectory. 5) Wait for the main data file and associated directory you copied above, to show up on all the other PCs, you installed Dropbox. 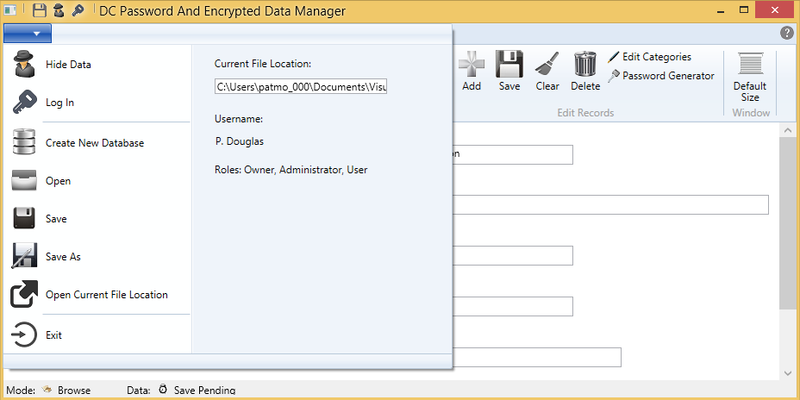 6) In every copy of the DC Password And Encrypted Data Manager you have installed on PCs other than the first, use the Open command in the application menu shown above, to navigate to the main data file for the DC Password And Encrypted Data Manager, in the subdirectory you originally created in the Dropbox directory or subdirectory. E.g. if you created the subdirectory DC Password Saver in the Dropbox directory on your first PC, and used Save As to copy the main data file (DCPasswordSaver.dps) for the DC Password And Encrypted Data Manager to that subdirectory: on all other PCs you have the DC Password And Encrypted Data Manager installed, use the Open command in the application menu shown above, to open the main data file (DCPasswordSaver.dps) present in the subdirectory DC Password Saver you created, in the Dropbox directory / subdirectory. 7) On all PCs other than the first you installed the DC Password And Encrypted Data Manager, click on the Miscellaneous tab - on the DC Password And Encrypted Data Manager's ribbon bar - then check the Synchronize Data check box, in the Data Synchronization section of the of the ribbon bar, to turn on data synchronization for copies of the DC Password And Encrypted Data Manager, on your other PCs. In order to ensure data synchronization works well, it is important that all PCs that have a copy of the DC Password And Encrypted Data Manager, have the same date and time setting - or as close to the same date and time setting, as you can reasonably make them. In other words, if one PC displays the current date / time as 10/23/2015, 8:41 p.m., ensure that all the others display the current date / time as 10/23/2015, 8:41 p.m. as well. Please note that after you have done the initial setup, you may turn data synchronization on or off at any time, for any copy of the DC Password And Encrypted Data Manager, by simply clicking on the Miscellaneous tab on the application's ribbon bar, then checking or unchecking the Synchronize Data check box, in the Data Synchronization section of the ribbon bar. What checking and unchecking the Synchronize Data check box does specifically, is turn off the ability for data edited in a copy of the DC Password And Encrypted Data Manager, to be seen dynamically reflected in an open copy of the application on other machine. Therefore if you uncheck the Synchronize Data check box in a copy of the DC Password And Encrypted Data Manager on a PC, and update the data in the DC Password And Encrypted Data Manager on a second machine, the copy of the application on the first PC will not dynamically update to show the change that was made to the data on the second machine. If you want generally fast data synchronization between copies of the DC Password And Encrypted Data Manager, on various PCs, it is recommended that you use Dropbox for only that purpose. If you use Dropbox to synchronize a lot of data beyond what is used by the DC Password And Encrypted Data Manager, synchronization may be slow and unpredictable, because of the extra volume of data needed to be manipulated by the service. You can use Dropbox to synchronize data between copies of the DC Password And Encrypted Data Manager, and another cloud directory service such as OneDrive, to synchronize the rest of your data. It is recommended that a particular user of several copies of the DC Password And Encrypted Data Manager on various PCs, not move between copies of the application, and edit data quickly, as this may result in data conflict issues arising with Dropbox. A particular user of several copies of the DC Password And Encrypted Data Manager on various PCs, may move quickly between copies of the application, but he should restrict the editing of data to one PC, within a relatively short (generally, 45 seconds or less) period of time. When a data conflict issue arises with Dropbox, data synchronization no longer works as expected. If data synchronization is not working as expected, you may check to see if you have a data conflict issue, by going to the application menu of a copy the DC Password And Encrypted Data Manager on a PC, clicking on the Open Current File Location command, then opening the directory associated with the main data file for the application. If you see one or more files marked as conflicted copies, delete the (conflicted copy) files, which should cause copies of the conflicted files on your other PCs, to be deleted. (Please note that if you delete the files marked conflicted copies, you will lose any data changes you made, that were captured by them.) The above should clear up any data synchronization issues that arise, due to data conflicts.